If you had asked me 48 hours earlier I would’ve told you I had no intentions of going to California, but there I was dialing a 415 area code. California, here I come. It was one of those freak occurrences. An opportunity that life just drops right in to your lap, and you’d be a fool not to take them. In my case it was a round trip from Toronto YYZ to San Francisco SFO for under $300. What’s the worst that could happen? I found myself explaining to the voice from the 415 area code. His name was Graham Skinner, a grey haired fella with an accent and a passion for motorcycles and ‘the biz.’ I had only emailed Graham at Eagle Rider Motorcycle Rentals San Francisco a few hours earlier. His call back was prompt and he had his stuff together before the call. We’re all a little busy and I always appreciate it when people have done their homework and and have a plan before making a call. Readiness. It’s hard to come by. 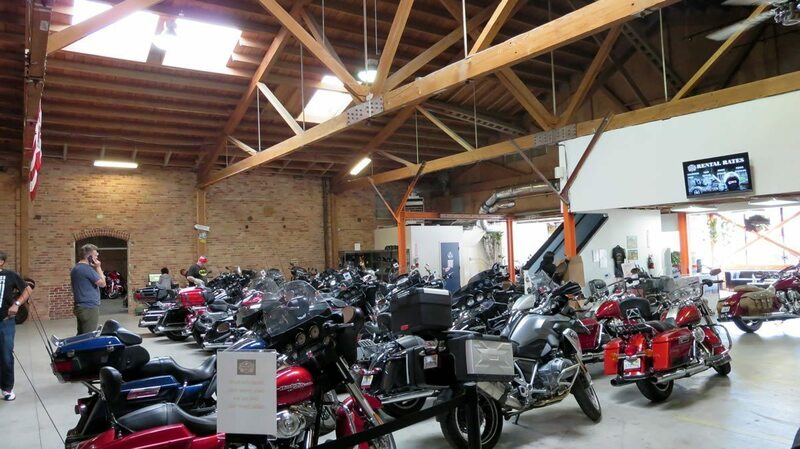 Graham is the General Manager at Eagle Rider San Francisco, a motorcycle rental biz on 8th just south of Market. 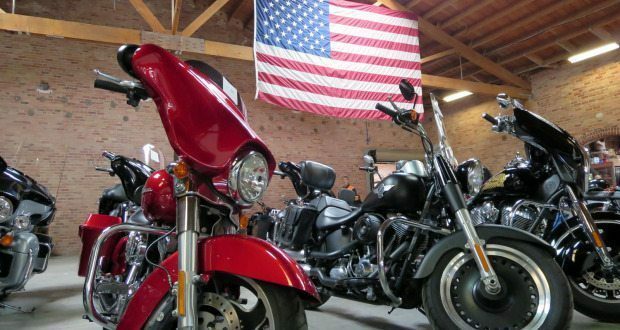 Eagle Rider’s motto is “We Rent Dreams” – believe it, because they do so – mostly. 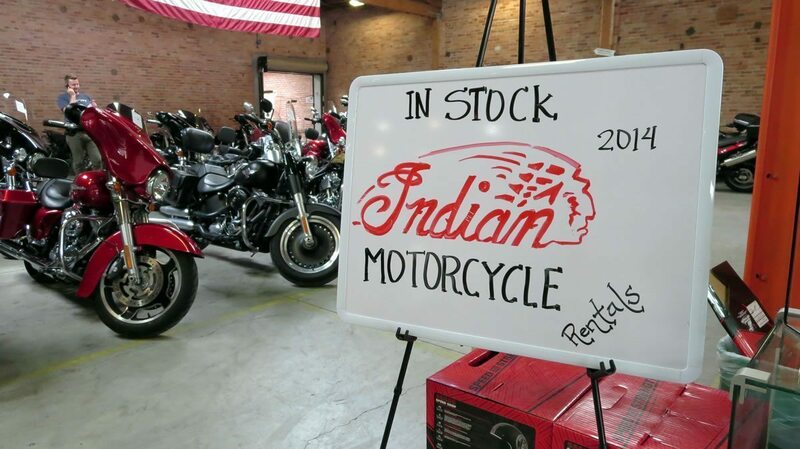 The company rents over 2,500 motorcycles in over 100 cities across the world. 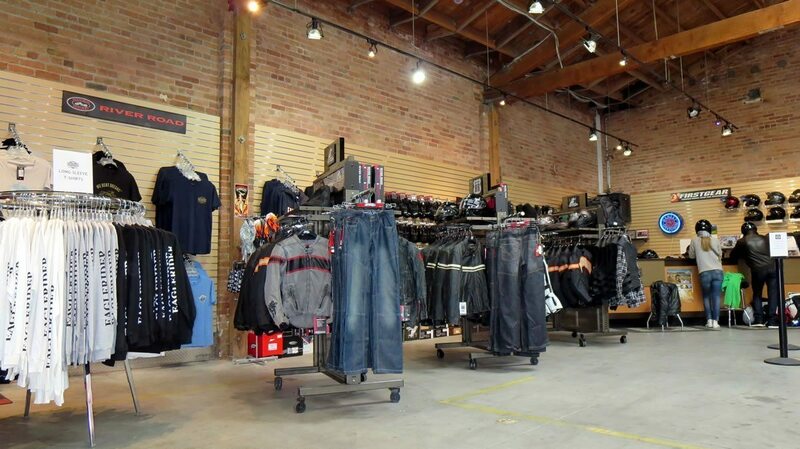 The San Francisco location houses not only rental motorcycles but optional extras such as bags, GPS units, gear, maps, accessories, information, and more. Eagle Rider San Francisco had already booked the Triumph Bonneville I was hoping to rent. It serves me right for only reserving a motorcycle rental two days in advance. Take note, folks, don’t book at the last minute! 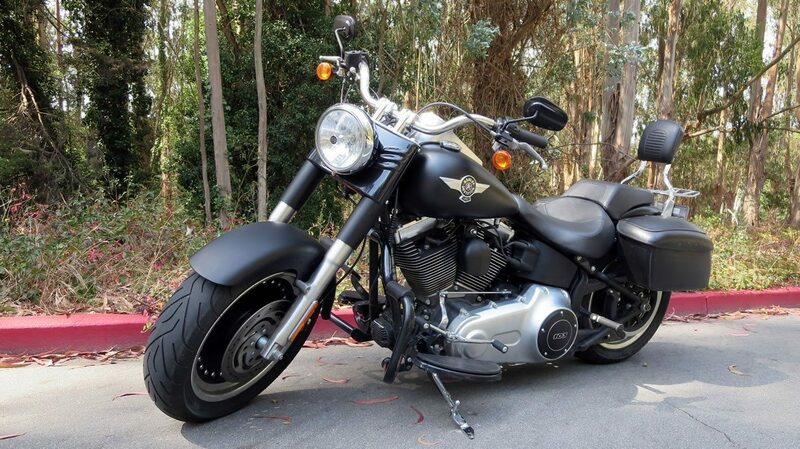 I ended up renting my second choice, a 2013 Harley-Davidson Fat Boy, with hard bags and a passenger backrest. Perfect. I left my hotel room on Grant St. bright and early. It was 9 AM. Ok, it was a little more bright than it was early, but I had spent the previous night bar hopping with two girls and a flight attendant we met on the plane. It got a little messy around 4 AM, and I can’t remember what happened after. I arrived on foot at Eagle Rider about 20 minutes and as many pictures of Market St. later. My rental bike was tested, ready, and good to go. I signed minimal paperwork and spoke with Harley who gave me the full run through on rentals, attractions, the local scene, the biz, and more. Harley and Graham explained the optional insurance, which was $20 so I opted for it. After an introduction to the Fat Boy, some directions, some advice, and a couple of handshakes, I was on my way. A huge smile exploded across my face. 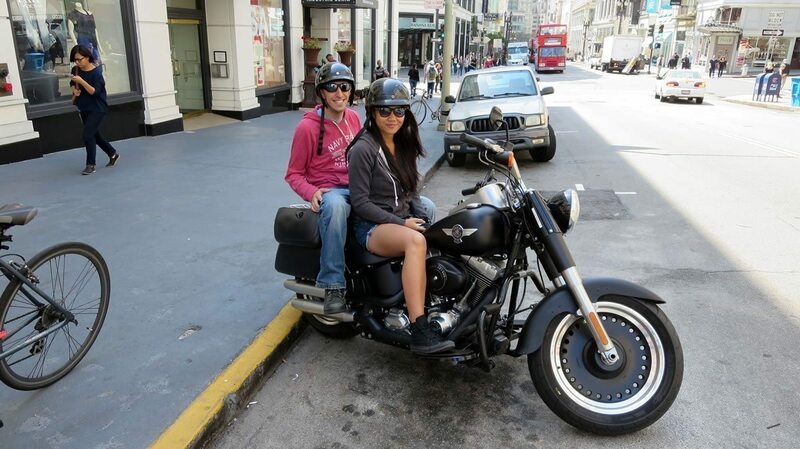 Riding a motorcycle in California, renting a motorcycle in California, what a great decision! I would only be in San Francisco for about 48 hours. In that time I saw neither the Golden Gate Bridge, nor the Haight-Ashbury ‘hood, and I didn’t dip my toes in the ocean either. I drank with flight attendants in an old brothel turned speak easy turned legally licensed bar. We drank with and hit the road with a local. I exchanged flirtations with another man’s date. I gave hell to one of my dearest and kindest friends, only to make up with her. I fell in love (twice), and somewhere in between all of my misadventures I had been lucky enough to ride a hog in one of the most beautiful cities in North America. The Fat Boy had given me no trouble at all. Things with the girls I was traveling with hadn’t gone according to plan and before long it was time to bring my air-cooled steed to her home. Back at Eagle Rider the bike was given a quick exam. I talked roads and the motorcycle industry with Graham and Harley for some time as Graham arranged for taxis to pick up a group of German customers. “We get motorcyclists from all over Europe.” Graham explained. Funny thing, isn’t it? 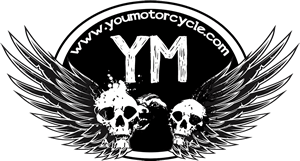 North American motorcyclists dream of riding in Europe. European motorcyclists apparently dream of riding in North America. It looks like the grass is always greener on the other side of the pond. Air cooled engines are beautiful… until they get stuck in San Fran traffic on Market St.
Eagle Rider San Francisco’s service was excellent. The boys were speedy, the bike was exactly what it should have been, and the price was fair. The staff was exceptional, just don’t get stuck in traffic. Grab the handlebar grips and get out of the city, you’ll be glad you did. Enjoy! Update: Heading to the East Coast? You may also want to take a look at our review of EagleRider Orlando. Nice choice or bike to rent. I had fun reading your adventure to Cali, keep on ridin!